The festival of Janmashtami commemorates the birthday of Lord Krishna, the eighth incarnation of Lord Vishnu. The festival is also referred to as Gokulashtami, or Govinda in Maharashtra. Lord Krisha is revered for his wisdom about how to live life on Earth. Late August or early September, depending on the cycle of the moon. The festival runs for two days. In 2018, it will take place on September 2-3. Throughout India. One of the best places to experience the festival is in the city of Mumbai. Celebrations take place at hundreds of locations across the city and Maharashtra Tourism runs special buses for foreign tourists. The huge ISKCON temple complex, in the beach side suburb of Juhu, also has a special festival program. In Mathura, the birthplace of Lord Krishna in northern India, temples are brightly decorated for the occasion, many with displays depicting important scenes from the life of Lord Krishna. In Jaipur, Vedic Walks offers a special Janmanshtami Festival walking tour. You'll get to learn about the importance of the festival, visit temples and local markets, and even royal quarters to experience the celebrations. 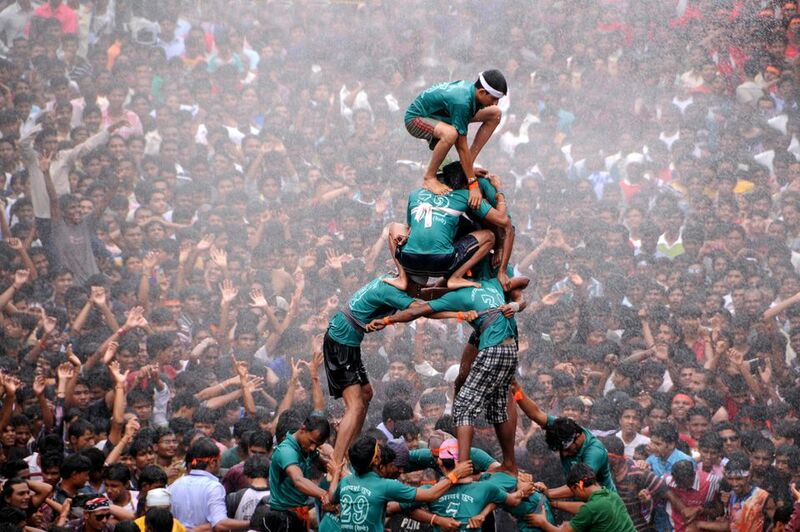 The highlight of the festival, which takes place on the second day especially in Mumbai, is the Dahi Handi. This is where clay pots containing butter, curd, and money are strung up high from buildings and young Govindas form a human pyramid and compete with each other to reach the pots and break them open. This celebration represents Lord Krishna's love for butter and curd, which were the foods he most often enjoyed eating. Lord Krishna was quite mischievous and would take curd from people's houses, so the housewives hung it up high out of his way. Not to be deterred, he gathered his friends together and climbed up to reach it. See Dahi Handi celebrations in Mumbai by going on this festival tour with Grand Mumbai Tours. One of the biggest Dahi Handi competitions (Sankalp Pratishthan Dahi Handi), which is centrally located, takes place at the Jamboree Maidan on G M Bhosle Marg in Worli. Bollywood celebrities often make appearances and perform there. Otherwise, head to nearby Shivaji Park in Dadar to catch the local action. Fasting is observed on the first day of the festival until midnight, when Lord Krishna was believed to have been born. People spend the day at temples, offering prayers, singing, and reciting his deeds. At midnight, a traditional prayer is offered. Special baby cradles are installed in temples and a small statue placed in them. The most elaborate rituals are performed at Mathura, where Lord Krishna was born and spent his childhood. Lots of chanting, with huge crowds at temples devoted to Lord Krishna. Children get dressed up as Lord Krishna and his companion Radha, and people play games and people perform dances depicting the various events in Lord Krishna's life. The Dahi Handi festivities, while fun to watch, can get quite intense for Govinda participants, sometimes resulting in broken bones and other injuries.